New Construction - Derby Ready! 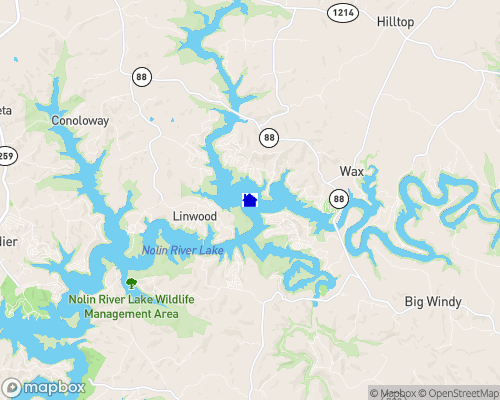 If you’re looking for lake homes for sale, set your sights on Nolin River Lake in South Central Kentucky. Reflecting over 200 years of rich American history and culture, Nolin River Lake not only showcases some of the state’s most spectacular scenery, but also echoes the actions and influences of the region’s earliest settlers. The lake’s own name captures an interesting moment in time, when American explorer Benjamin Lynn found himself lost in the area. For days, his search team was forced to report “no Lynn,” until he was finally reunited with his friends. Today, Nolin River Lake is known more for the many recreational activities it offers on its distinctive blue/green waters. Anglers know these waters well, casting their rods for walleye, bass, catfish, and crappie. In fact, many anglers choose to fish under the cover of nightfall or head upstream to Sportsman’s Paradise for prime walleye action. With 5,795 acres of surface water to explore and savor, anglers of all skill levels look forward to baiting their hooks on the lake. Nolin River Lake spans across Edmonson, Grayson, and Hart Counties, and it is only 95 miles from Louisville. Lake properties for sale enjoy full access to the area’s numerous marinas, campsites, and accommodations. In addition to swimming, boating, and jet skiing, many water revelers take to their canoes and kayaks to really experience the scenic side of Nolin River Lake. Such lake explorations put you in close proximity to Mammoth Cave National Park and all its natural wonders. Even from the shoreline, lakefront properties share in the region’s stunning topography. Dry off on one of Nolin River Lake’s sandy beaches and spend a fun day at any of the lake’s 32 campsites. Each one is slightly different and offers a unique perspective of the scenery. Claim your own piece of the wild while hiking a local trail, or focus all your concentration on the bull’s eye during a proper archery match. Several area golf courses even combine the love of nature and the love of the game, having players tee off against a backdrop of classic Nolin River Lake landscapes. If you’re interested in living on any of Nolin River Lake’s area golf courses, visit GolfHomes.com for property listings. Lake-view homes are also only a short drive from Bee Spring and approximately 20 miles from Leitchfield. Explore the history of the area with a visit to Jesse James Riding Stables and the Diamond Caverns. And for a timeless treat, chose a prime cut at Sahara Steakhouse, in Cave City. Nolin River Lake marries Kentucky tradition with trademark scenery, keeping history alive in each fond memory made on the lake. Nolin Lake is the centerpiece of one of Kentucky's newest state parks. The 5,795-acre lake is popular with boaters and fishermen. The 333 park acres rest along the northern edge of Mammoth Cave National Park. In the scenic hills of Edmonson, Grayson and Hart counties, you’ll find 5,800 acres of crystal clear water. Facilities on the lake include wave runners, ski, pontoon and fishing boat rentals. Fully furnished cottages and bed & breakfasts, a state park, as well as individual camping and picnic sites are available near the lake. The natural habitat of the lake is perfect for game fish. In-season catches include smallmouth and largemouth bass, crappie, bluegill, walleye and catfish. This is a Corps of Engineers flood control project and there are strict regulations to protect the lake. It is approximately 6500 acres at summer pool and is 30 miles long. The winter pool level allows for continued boating and fishing. Why not RENT a Lakehouse on Lake Nolin while you are viewing houses or lots for sale? Check out other website for Lake Rentals, LakeHouseVacations.com. Other: Brier Creek State Park and the 8 mile mountain bike and walking trail. Nolin River Lake Fishing Guide - Terry Watts Fishing Guide on Nolin Lake I have 30 years experience teaching aquatic habitats. I am an experienced pro team angler. I am an experienced rep in the fishing industry. KY licensed guide and KDFWR boating certified.I am a former Master Angling Instructor. Check out the US Army Corps of Engineers website http://parks.ky.gov/parks/recreationparks/nolin-lake/default.aspx to find out more about attractions near Nolin Lake. Call Cindy Hack, Then Start To Pack!